Cruise into the Las Vegas sunset with NetEnt’s Hotline slot. Not only will you cruise down the warm boulevard with a jazzy 80s vibe that will all remind you of Miami Vice, but you’ll also enjoy some seriously funky bonus features as well. 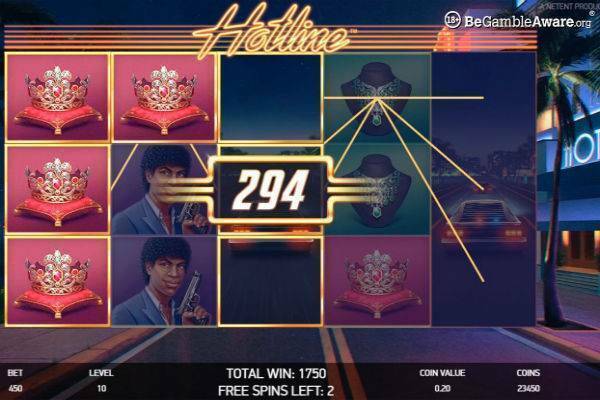 Hotline is 5 reel, 30 payline game where you can choose to how many “hotlines” to activate; if you get a Wild symbol on a hotline, it will expand to cover the entire reel. We’ll explain it more in “How to Play” and in the “Special Features” sections, but if you can’t wait, then you can go right over to these top slot sites and see it for yourself! As with all slots, you should start by setting your bet size. Adjust the coin value, which goes from £0.01 to £1. The 30 paylines are fixed so there’s nothing to adjust there, so just set your bet level ranging from 1 to 10. You bet a minimum of 15 coins per level. This means the minimum bet per spin is £0.15. So let’s get to the Hotline part. On the left side of the game screen, you’ll see 3 round buttons next to each row. Select one and you’ll activate that Hotline. There is always one selected, but you can choose up to 3. Each hotline will cost you 15 coins more. Why would you want to spend that extra money? Because when the a Wild falls onto a hotline, it’ll expand through the entire reel and give you a re-spin. After that’s all set, you’re good to press Spin. As usual, there’s a Max Bet button that will automatically increase your bet level to the maximum of 10, while keeping your coin value fixed. Autoplay is also available when you want to kick back. The symbols from highest to lowest value are: Woman with Phone, Man with Gun, Man with Sunglasses, Red Crown, Green Necklace, Blue Ring. The Wild is the Red Corvette, with Wild written on the plate. There’s also a Scatter symbol which is a sunset with Scatter written on it. The fixed jackpot in Hotline is 200x your bet level and it’s won by spinning 5 of the Woman symbols – so that translates into 2,000 coins. This isn’t the biggest jackpot we’ve seen around, but most players are playing this game because of all the special features, which do make up for the relatively small jackpot size. The wins in Hotline are more modest, but at the same time also more frequent. Hotline Bonus Bet: At anytime, you can choose to change the number of Hotlines to activate, with each Hotline coming at a price of 15 coins per level. You choose the Hotline, it will highlight the places that become “Hot” and when a Wild symbol (the Red car) falls into an active Hotline, it will expand into a Wild Reel. And once all your winning paylines are calculated, you’ll get another re-spin with the Wild Reel in place. The Wild substitutes all symbols except for the scatter to form a winning payline, so there could be more than a few sweet wins here! 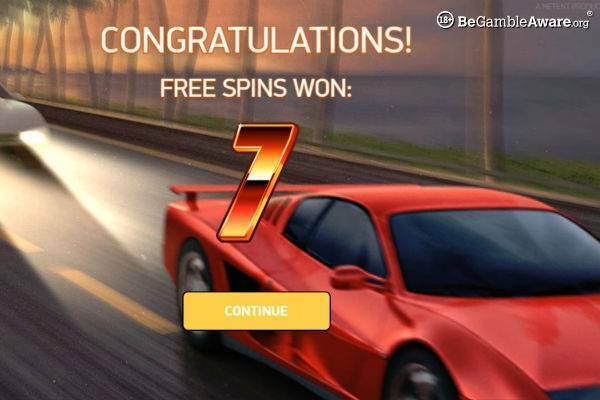 Free Spins Bonus: Spin 3 Scatter symbols (the sunset) on reels 1, 3 and 5, and you trigger the Free Spins bonus game. You’ll get 7 free spins here and if you get a Wild Reel from a Hotline, the reel will stay wild throughout the entire bonus game. Hotline has a groovy 80s theme with big hair, neon lights, and glowing sunsets. That having been said, the animation itself is slick and flawless with a distinctively modern feel. The reels spin smoothly, and paylines light up sharply with your wins. Of course, watching the Wilds expand is a real thrill and big wins will take over your screen completely. The soundtrack is upbeat and is the finishing touch to make this game a parallel to our favourite TV shows of yore like Miami Vice. 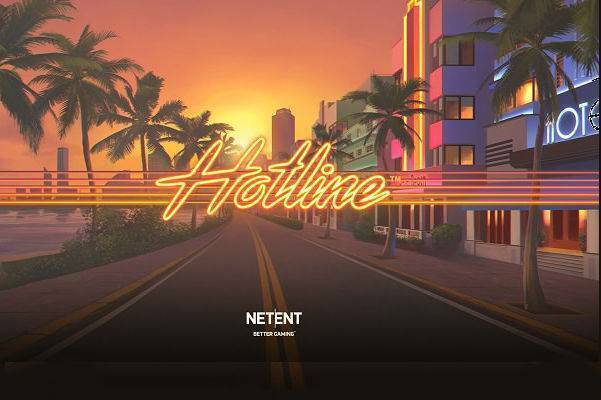 Hotline is one of NetEnt’s most anticipated and popular releases in 2018. 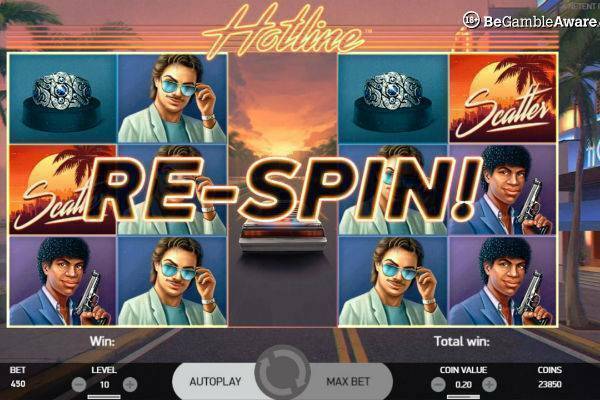 The Hotline Bonus Bet feature lets players up their chances to get expanding Wild Reels and Re-Spin, which is afterall just another name for a free spin! There’s also a special Free Spins Bonus round to top things off. Visually, this game is just pure eye-candy with its warm sunset colours and the groove of Miami Vice, all lined with razor sharp animation. It’s easy to see why Hotline has been such a hit. Take it out for a spin at one of our recommended slot sites!